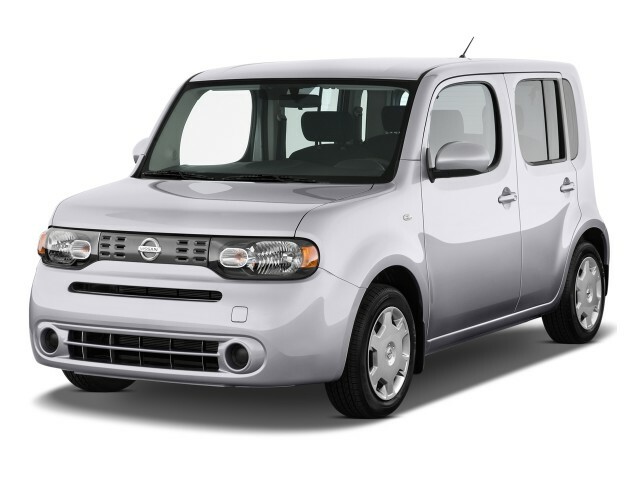 The 2010 Nissan cube is not for everyone and that's a good thing. A four-door double-box with side opening rear swing-out door, this is one machine that has attitude to go with its unique box-like styling. Nissan, which does not capitalize the C in cube, has several different varieties of this quirky hatch available, all equipped with a 1.8-liter engine. The machine driven here is the top of the line Nissan cube Krom, which is pronounced with a long o, making it sound like the design cues at the front of the car: chrome triple upper and lower horizontal bars. These make the Krom model distinctly different from the other four cube variations (which start at $13390 plus destination). The interior of the 2010 Nissan cube Krom also has its own style points, with unique black/gray fabric adorning the seats, carbon-look surrounds for the shifter and air vents, rubber-tipped aluminum pedals and 20 adjustable colors for the interior lighting. The test vehicle had a nice, relaxing blue tint set for it. The heart of the front-wheel-drive Nissan cube Krom is its 1.8-liter 4-cylinder engine, which puts out 122 horsepower at 5200 rpm and 127 lb-ft of torque at 4800 rpm. This might seem anemic, but our cube weighed all of 2869 pounds--Krom is the heaviest cube available--so the power was perfect for the package. Nissan only markets the 2010 cube Krom edition with its lovely continuously-variable transmission (CVT), which has excellent shifting characteristics. On flat roads, 70 mph equals about 2400 rpm and 80 only goes up to 2800 on a vehicle that has a 6500-rpm redline. There's plenty of reserve power here. The ride on the 2010 Nissan cube Krom is not very rough despite its 157.5-inch length, 66.7-inch width and height of 65 inches (taller than this driver). The Krom rides on a wheelbase of 99.6 inches, giving it little overhang front or rear and aiding in cornering capabilities. Front independent struts and rear torsion beam suspensions provide a lithe feel to this little box. Equipped with front disc and rear drum brakes, the addition of all-wheel ABS, electronic brake-force distribution and brake assist help this machine stop effortlessly. Speed sensitive electric power steering has good tactile feel to it and the turning circle of 33.4 feet is nearly effortless and spot on. Nissan fits 195/55R Toyo tires at all four corners, with 16-inch polished eight-spoke alloy rims. They are handsome and, because they're not terribly large or low-profile, the wheel-tire combo manages to keep the ride fairly compliant. The integrated look of the 2010 Nissan cube Krom includes exterior add-ons: the integrated underbody spoiler, front fascia and grille, the slight body side sill extensions and its rear fascia, ending with a rear roof spoiler that aids aerodynamics. Inside, all is quite modern for the driver, who sits in front of a black 140-mph speedometer with blue surround and tachometer rimmed in gray. 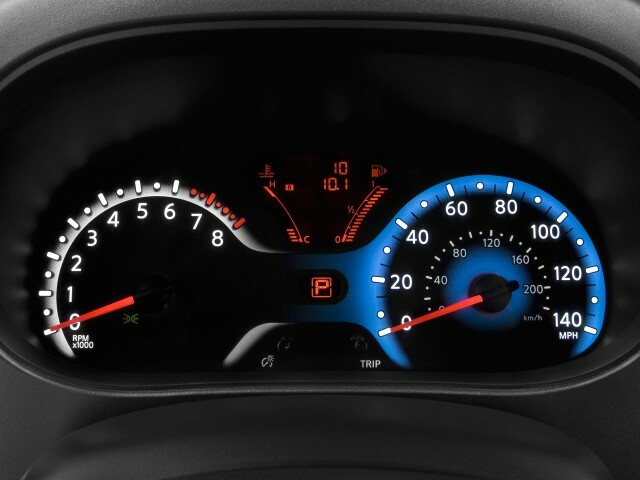 The LED temperature (yippee) and fuel readouts lie between these gauges, as does the transmission indicator. Unfortunately, the instruments have a tendency to wash out in direct sunlight. The trip computer operates through the trip odometer button, an easy solution. The cube uses a key for ignition; no pushbuttons here. I like the central heating/air conditioning/ventilation wheel operated by pushbuttons, with system indicator in their centers. Automatic climate control is available. Steering wheel controls operate the upgraded Rockford Fosgate audio (with subwoofer) on the left, along with hands-free phone and cruise control on the right. The audio system is terrific and can be set up for satellite radio, although none was fitted to this particular cube Krom. There is no covered storage in the cabin, but interior space abounds with 97.7 cubic feet of passenger volume. There's good space in the rear too. When the covered rear hatch area of 11.4 cubic feet is extended by using the 60:40 fold, cargo capacity grows to 58.1 usable cubic feet. The driver's seat has height adjustment and all passengers sit high in this small hatch, but I found the seat bottom a bit over-bolstered and having little lateral support. The fuel release is very low on the dash, near the driver's door and hood release. There are cupholders in all four doors as well as the obligatory central holders. I liked using the one to the left of the steering wheel, particularly with the air conditioning engaged. For an additional $100, you can get a vehicle alarm impact sensor, bringing the total to $21,170. Compared to a Scion xB, the Nissan cube has plenty more personality and certainly feels a lot more lithe than its competition. The EPA rates the cube Krom at 28/30 mpg from the good-sized 13.2-gallon tank and it runs on regular fuel. Over the road, the cube does better than rated. On my watch, it averaged 31-32 mpg for more than 500 miles in one week. The vehicle I drove had nearly 12,000 miles on the odometer, so it was fully broken in. It should be easy to do more than 350 miles on a single tank in mixed driving, no matter how politically incorrect the operator. Nissan places front, front-side and B-pillar head-curtain airbags in the 2010 cube Krom, together with active headrests for the front-seat occupants. There are also traction control and vehicle dynamic control systems, along with tire-pressure monitoring, giving it both active and passive safety elements. So what's left? Not a thing, except the ability to get in, drive and enjoy. The Nissan cube Krom can bring enjoyment to the chores of commuting, and its propensity to swallow whatever a driver needs to transport endears it to just about anyone. While its aesthetics may be polarizing, they do set the 2010 Nissan cube Krom aside from the crowd.